Located between Nar and Narayan mountain ranges, the Badrinath temple in the Chamoli district of Uttarakhand is naturally blessed with untouched natural beauty and breathtaking surroundings. One of the holy places of the Chote Chardham Yatra, this temple is perfectly placed in front of the huge Neelkanth mountain peak. The temple name Badrinath is derived from Badri, which means the place where berries grow in abundance. With various holy legends and myths associated with it, Badrinath Dham holds prevalence in the sacred travel list of the Hindu pilgrims. Travelling to this holy place is an ideal option for the pilgrims who want to rest in the middle of calm and peaceful surroundings. 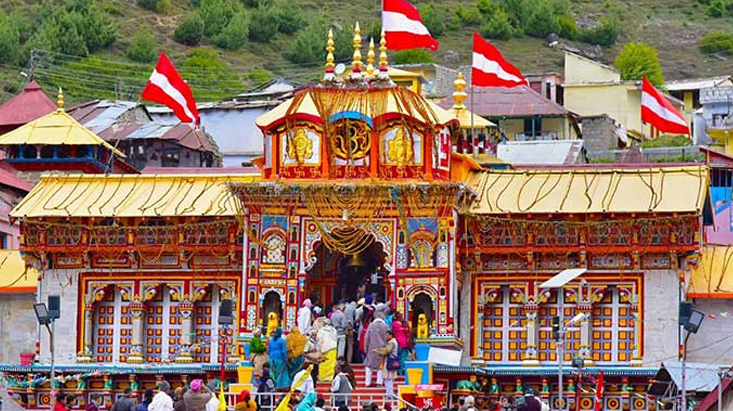 Apart from the main Badrinath temple, pilgrims on Badrinath Yatra can even travel to some other interesting places located nearby Badrinath in order to have a mesmerizing experience. A short and simple trek of around 4 km from Mana Village will take the travelers to the Vasudhara Falls. Set at a height of 12,000 feet above sea level, it is 400 feet high and appears as if milk is falling from the mountain when seen from a distance. It is said that the water drops do not fall on the offenders. Satopanth is the place that leads the way to the Swargarohini peak from where according to the Mahabharata, Yudhishthir and the dog were sent to the heaven. Also, the lake is believed to be the point where Bheema was denied to enter the heaven. With clean and pure water, Satopanth Lake offers breathtaking views to the travelers. There are no rest houses and villages on the way to Satopanth, therefore, travelers can rest in temporary tents and caves. Located 24 kms from Badrinath, Pandukeshwar is believed to be established by the father of Pandavas, King Pandu. The place has two temples that are centuries old. Out of them, one of the temples is dedicated to Lord Yoga Badri Narayan and the other one is dedicated to Lord Vasudev. During winters, the temple of Lord Vasudev operates as a home for Lord Badri Narayan and all the daily prayers and holy rituals are performed in Lord Vasudev’s temple. It is one of the ‘Maths’ established by Guru Adi Shankaracharya and functions as the abode of Shri Badrinath during winters. Well-connected with Auli by cable car, the highest cable car of Asia, Joshimath is located at an altitude of 1,890 mts above the sea level and 46 kms from Badrinath. The tourists can also visit Narsingh and Kalpavriksha temple while traveling to Joshimath. Located at a height of 3050 mts above sea level and 60 kms from Badrinath, Auli is a famous Paragliding and skiing spot in Uttarakhand state of India. It offers amazing views of the captivating snow-covered Himalayan mountain range. The place is well connected with Joshimath through Asia’s longest cable car. Further, it is also accessible via motorable roads. Nestled in the western Himalayas, Valley of Flowers National Park covers an area of around 87.50 sq kms. Located 16 km from Govindghat, the valley is covered with layers of white snow during winters and blooming flowers from June to October. It was announced as a national park in the year 1982 and listed among the world heritage sites. The valley is a paradise for nature lovers, botanists and adventure enthusiasts. Located at a distance of 17 kms from Karnaprayag, Adi Badri is easy to reach by motorable road. The main temple situated here is dedicated to Lord Narayan. Established by Adi Guru Shankaracharya, the temple has a black stone cave statue of Lord Vishnu. Hemkund Sahib is the worship place of Guru Govind Singhji, the tenth Guru of the Sikhs, who meditated at this place for years. Situated at an altitude of 4,329 mts above sea level in the middle of many snow covered peaks, collectively known as Hemkund Parvat, it is a star shaped Gurudwara set close to the lake. The place is visited by thousands of devotees every year. Also, there is a temple of Lord Rama’s brother, Lakshman located here. Tapovan Hot Water sulphur spring is just 10 kms away from Joshimath. The strong smell of sulphur is present all around the area. The natural overflow from the hot water spring gets collected in a small man-made Kund where travellers take a dip due to the high medicinal significance of the water of the Kund. Situated 28 kms from Joshimath, Chenab Valley is an unexplored valley filled with flowers that grabs the attention and interest of the nature lovers on the way to Badrinath yatra. The valley is acknowledged for offering breathtaking views of the extensive meadows covered with a wide variety of flowers. Tourists can witness a great variety of flowers including primulas, marigold, brahmakamal, orchids, daisies, poppies and anemones. The valley is also blessed with an extensive range of plants with medicinal value like Sal, Rhododendron and Teak. Just below the Badrinath temple lies the Tapt Kund hot sulphur spring that has a high medicinal value. It is a freshwater pool with the bathing area of 16.1/2 feet by 14.1/4 feet. Even though the normal temperature of the spring is 55°c, the temperature of water keeps increasing gradually during the day. A dip in Tapt Kund is regarded as a good medical cure for skin diseases. Narad Kund is situated near Tapt Kund. It is believed that the Badrinath idol was obtained from this kund. Narad Kund hot water spring is positioned under the Garur Shila and holds a medicinal value. Devotees take a dip in this kund before entering the Badrinath temple for Darshan of Lord Badrinath. Vyas & Ganesh-Gufa cave is located in the Mana Village along with many other caves. It is believed that in this cave Ved Vyas dictated his famous epic of Mahabharat to Ganesh and therefore it has been named Vyas Gufa. There is an idol of Ved Vyas shown writing the granth (epic book) inside this cave. Located 3 km from Badrinath on the right bank of the Alaknanda River, Mata Murti Mandir is an ancient temple devoted to Shri Badrinath’s mother. It is one of the top tourist places of the Mana Village. The legend related to this temple is that Mata Murti worshiped Lord Vishnu and requested him to be born as her son in his next birth. Agreeing to this, Lord Vishu came from her womb as twins, Nar and Narayan, in this world to kill the devil. These above mentioned are some picturesque and eye-catching places located near the Badrinath temple that draw the attention and interest of a large number of travelers from around the world every year.